Jose Sanchez III's Rl First Dash was the fastest qualifier for Saturday's $434,538 LQHBA Sale Futurity (RG1) at Fair Grounds Race Course & Slots . NEW ORLEANS, LA—SEPTEMBER 4, 2018 –Saturday's $434,538 LQHBA Sale Futurity (RG1) at Fair Grounds Race Course & Slots could easily go down in the record books for several noteworthy events. Due to tremendous interest from horsemen, including five supplements to the August 17 trials, it is the richest purse in the history of the stakes. It also marks the debut of 23-year-old trainer, Jose Sanchez, III, who won five trials and qualified four to the final. And one other very significant mention is that each of the Sanchez trial winners were ridden by Jose's younger brother, Eddie. Jose, known as "Joe" is a third-generation horseman. Growing up in Laredo, he learned from his grandfather, Luis, and father, Jose. Other family members with strong racing backgrounds include uncles, trainer Angel Sanchez and former jockey, Luis Ramirez. Joe is a quiet, thoughtful young man with a tremendous instinct about horses, matched with a tireless work ethic. With his father serving a suspension, Joe, who had always been a central figure in the success of the Sanchez barn, thought long and hard about getting his trainer license. "It was a big step and I was nervous about making the decision, but I am happy to be training these great horses," he said. On Friday, August 17, the Sanchez brothers teamed up to win five of the 11 trials. It was a rainy day and each of the trials were run on a sloppy track. At the end of the afternoon, the Sanchez brothers had four finalists heading back to New Orleans for the rich final. Rl Fast Dash, Amending The Bar, Zoom By Me and Mr Coahuila came out of their trial wins in good order and returned to the Sanchez farm in Stockdale, Texas. "It was a great day for us," said Sanchez. "The way they all handled the sloppy track was really good." Eddie acknowledged the hard work of those behind the scenes that rarely get the credit they deserve. The brothers appreciate grooms Sergio Lira, whose nickname is "Chino" and Gregario Reyes Lopez, also known as "Gollo"
"Our grooms are with the horses 24-7 and Jose Arriaga breaks all our babies," said Eddie. "We would not be where we are without them!" LQHBA 2017 champion owner Rogelio Marquez, Jr. has two juveniles in the final. Rl First Dash won the fourth trial in :17.352, which held throughout the afternoon as the fastest clocking. His filly, Zoom By Me, a sister to 2015 Lassie and Lee Berwick Futurity champion Jessa Louisiana Zoom, set the fourth-fastest qualifying time. Rl First Dash, bred by Weetona Stanley and Raymond Loup, is a son of Jess Louisiana Blue out of the Pyc Paint Your Wagon mare Pyc First Prize Dash. 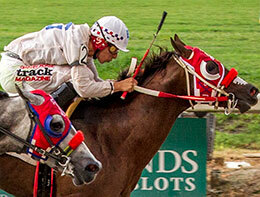 He was a $17,000 LQHBA Yearling Sale purchase and earned a career-best 101 speed index in his LQHBA Sale Futurity trial. "We liked him at the sale and everyone on the farm felt he would be a good one," said Marquez. Zoom By Me was a $68,000 purchase, but the April foal impressed Marquez with her conformation. Lisa and Stephan Ralston bred the filly by Heza Fast Dash out of the Azoom mare Zoomin for Cash. The Sanchez brothers teamed up again for a sharp win by Amending the Bar for owner Julio Caesar Ramirez, who won the tenth trial of the afternoon in :17.374, which was the second-fastest clocking of the day. A filly by Five Bar Cartel bred by Ray and Brenda Trahan qualified for the Lassie Futurity, running sixth in the final. They also qualified Lee Berwick runner-up Mr Coahuila who won the fifth trial in :17.454 for owner Emmanuel Villarreal. The son of Game Patriot was bred by Roy Simon, purchased for just $13,500 at the LQHBA Yearling Sale. Villarreal, who lives in Washington state, has only been a Quarter Horse owner for the past three years. He had success with Katharsis, a filly trained by Joe's dad, Jose. The Texas-bred won five races, including the 2016 Gillespie County Fair Futurity. Last year marked his first visit to the LQHBA Yearling Sale in Kinder. "I am relatively new to Quarter Horse racing and was looking to buy a yearling," said Villarreal. "When I saw Mr Coahuila in the sale ring, he just blew my mind and I had to buy him! He's very sound and his last two races have been outstanding. Plus, we believe he will be really good at 400 yards. "v Eddie had the very tough decision on which of his four mounts to ride in the final and decided on Mr Coahuila. "It wasn't an easy decision," said Eddie. "But Mr Coahuila has the experience and ran big in the Lee Berwick." It was up to Joe and the owners to choose riders for the other three finalists. "Right after the last trial, I got calls from all the agents," said Joe. 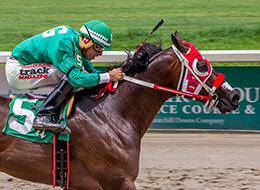 Saul Ramirez, Jr., who recently returned to the saddle, has the call on Rl Fast Dash; Luis Vivanco, a veteran jockey on the Texas circuit who finished second in this year's Delta Downs meet, rides Zoom By Me and Jorge Linares, another experienced rider, will pilot Amending The Bar. It will be a huge opportunity for Joe Sanchez to saddle his first futurity winner, even though he knows the drill with many past champions trained by his father, including 2017 LQHBA Champion 2-year-old filly Dashnunder Afullmoon. "There's only one horse that can win," stated Joe. "But is sure would be nice to run 1-2-3-4!" Joe and Eddie are very close, but personality-wise, they could not be more different! Eddie is 5'10" tall, confident with an engaging smile. "I am tall, but can get really small on the back of a horse," he explained. "I've heard the comments about my height being an issue, but love to prove those people wrong!" Joe lost his hand in a farm accident when he was just 3-years-old. It was a tragedy that could have scarred him more emotionally, than physically. But, with the support of his family, a very sharp mind and undeniable determination, he persevered. v "He played football and the coach told the rest of us to quit complaining and look at the mental toughness of my brother," Eddie said proudly. "I love him to death, and am very proud of his success just beginning his career as a trainer. He's learned so much from my dad and grandfather, but he's not afraid to do it his way." The Sanchez brothers are not the only family affair to root for in the September 8th final as Guidry Pride II, with a qualifying time of :17.409 seconds, is trained by Wendy Garcia and will be ridden by her husband, Modesto Pina. Bred by Johnny and Cynthia Guidry, the colt is sired by Sir Runaway Dash out of Guidrys Boodie Doo, a winning homebred daughter of champion Panther Mountain, and was purchased for just $6,500 at last year's LQHBA Yearling Sale. 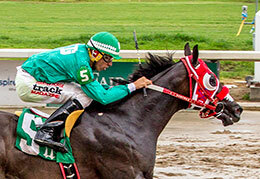 He was the winner of the $294,292 Mardi Gras Futurity (RG2) at Louisiana Downs last March for owner Edmundo Juarez. Louisiana breeders are well-represented in this year's LQHBA Sale Futurity with progeny from eight stallions qualified for the final. Jumonville Farms venerable stallion Jess Louisiana Blue is the sire of fastest qualifier Rl First Dash as well as Rf Fast Dash N Blue, who set the tenth-fastest time on August 17. Robicheaux Ranch is represented by four stallions. Five Bar Cartel, whose daughter, Amending The Bar enters the final off the second fastest clocking; Heza Fast Dash, the sire of Zoom By Me and Logans Fast Dasher. Mr Coahuila is sired by Game Patriot and Jet Black Patriot, who also stands at Robicheaux Ranch produced ninth-fastest qualifier Tan Jet. Tate Farms stands Sir Runaway Dash, who sired Guidry Pride II and first-crop sire Highest Fire, sire of seventh-fastest finalist, Tdz Slinkys Fire. Louisiana Center For Equine Reproduction stands Fast Prize Dash, whose son, Tetris B set the sixth-fastest qualifying time. The LQHBA Sale Futurity had its first running in 1984 with a $87,970 purse. Due to the growth of the LQHBA Yearling Sale and five $11,000 supplements, the finalists will compete for a record purse of $434,538. The winner will receive a check in the amount of $195,542. "What a great field for this year's LQHBA Sale Futurity!" said Tony Patterson, executive director of the LQHBA. "The record purse and the fact that so many different breeders have finalists is very impressive. We love the pride that owners take in their horses and the excitement they have in running them right here in Louisiana. With four additional undercard stakes prior to the LQHBA Sale Futurity, Saturday will be an exceptional day at Fair Grounds!" The countdown is on for Saturday's final and the crowning of yet another outstanding Louisiana-bred Quarter Horse champion! Martha Claussen served as publicity director at Sam Houston Race Park for ten years and continues to be active in writing, fan education and Quarter Horse racing publicity in Texas, Louisiana and other regions in North America.